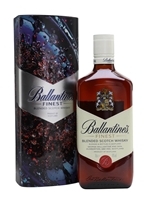 A limited-edition Ballantine's Finest with striking artwork from vocalist Reeps One. The piece was created by playing an original Reeps One track, Surfaces, through an audiovisualiser filled with Ballantine's whisky. As the music travelled through the liquid, the resulting vibrations were illuminated with coloured lighting to create a unique piece of sonic art.